This is Steve Ragsdale’s yarn—’Desert Steve’ of Desert Center. Nearly everyone who has traveled Highway 60 across the Chuckawalla desert in Southern California has heard of Desert Steve. He has a story for every occasion. This is the one he told in the early days when timid folks from Eastern centers of tenderfoot culture would stop at the Ragsdale service station to inquire about the danger of Indians, outlaws and rattlesnakes. The California link in Highway 60 is paved now and thousands of motorists roll along its smooth surface every week without thought of the hazards which once beset the desert traveler. Steve Ragsdale is one of the pioneers along this highway. He was doing very well as a cotton rancher in the Palo Verde valley until the post-war slump hit the cotton market. 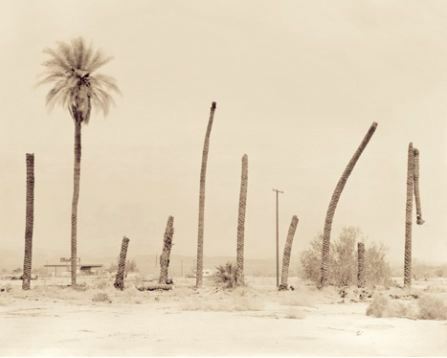 He couldn’t feed his wife and four children with six-cent cotton, and so he turned the ranch over to the tax collector and announced that he was going to open up a service station at Gruendyke’s Well, midway between Blythe and Mecca on the old Chuckawalla road. Folks laughed at Steve, and felt sorry for his family. The road across the Chuckawalla in those days consisted of two rather uncertain ruts across 90 miles of blow sand and cross-washes. It required nine hours of hard driving to cover the 90 miles. Only the hardiest of motorists would attempt the trip. There were many days when not a single car was to be met along this route. Six automobiles in 24 hours was heavy traffic. But Mrs. Ragsdale was willing, andthe four children were too young to vote on the question—so they loaded up the furniture and went out to rebuild the little cabin which Old Man Gruendyke had left when he proved up on his homestead. That was in 1921. During the next four years they stuck to the job through summer heat and sandstorms. A little work had been done on the road, and travel was increasing. The Ragsdales had begun to feel that perhaps their pioneering would be rewarded. Then the state took over the highway and engineers decided that the Chuckawalla road should be rerouted to avoid the heavy sand. Gruendyke’s Well was to be a mile and a quarter from the new highway. This was heart-breaking news to the Ragsdales, but they took it like true pioneers. Instead of crying about the injustice of the government and clamoring for damages, Steve went out and helped the engineers locate the new road. Then he began preparations to move his service station. The main problem was water. It is a scarce commodity in the Chuckawalla valley. With a hand windlass and the help of his family Ragsdale dug nine holes—all of them dry. Then he brought in a well drilling outfit and found water at 423 feet. It cost $12,000 to develop the new well. His difficulties in raising the twelve thousand make a story more thrilling than fiction. 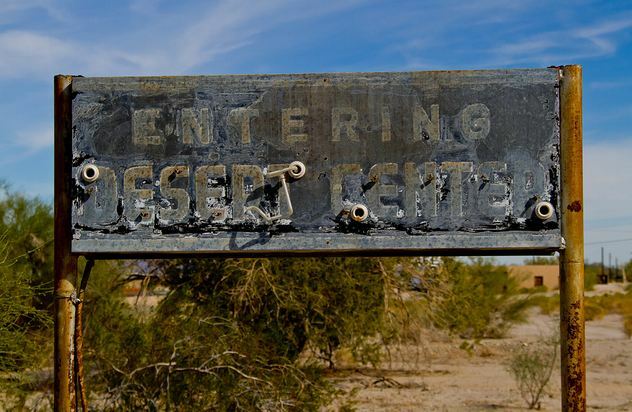 A new location called for a new name—and so Desert Center was born. Today an average of 500 cars a day pass through the little settlement on the Chuckawalla desert. It is a one-man town. Desert Steve not only owns all the real estate, but he is also the law. For many years he has been a deputy sheriff not only in Riverside county, but also in San Bernardino and Imperial counties. At one time he thought of subdividing his 700-acre homestead and selling part of it. But he wanted the deeds to carry restrictions against liquor, gambling and wild women. He wanted them drawn so that a man could not even take a drink of his own beer on a lot bought from Steve Ragsdale. The lawyers said that was going too far. It couldn’t be done. So the elegant plans which the engineers and architects had prepared were shoved into a pigeonhole—and are still there. Ragsdale’s antipathy toward commercialized vice is natural. It is a carry-over from the days when he was a parson. He was born in Coffeyville, Kansas, but spent most of his early life in Missouri where he went to theological seminary and became an ordained minister of the Methodist church. That was in the old fire and brimstone days—and Steven Ragsdale was a young volcano in the pulpit. In his inner heart, however, he never could quite accept the idea that the mountains and rivers and forests were made literally in six 24-hour days. And since, in his time and place it was heresy to believe otherwise, he finally resigned his pastorate and went into the lead mines to make his livelihood. In 1908 he moved with his wife to California and in 1909 filed on a homestead in the Palo Verde valley. Despite his religious schooling, Desert Steve has two vices. Those tall yarns with which he entertains the tenderfoot visitors at Desert Center constitute one of them. The other is—poetry. He writes the world’s worst verse. The irony of it is that while there are countless numbers of fine poets whose genius goes unrewarded, Desert Steve makes money out of his rhymes.He uses them for advertising purposes. There is a homely philosophy in Steve’s doggerel which appeals to folks despite its bad technique. Beneath these black-faced lines area low lines of Steve’s own poetry. “But the blankely-blank souvenir hunters keep stealing the poems off the trees,” complains Steve. Ragsdale was a desert eccentric of the first order, and his advertising for Desert Center in publications such as Desert Magazine reflected his personality: “U Need Us – We Need U”, “Our Main Street is 100-miles long!”, “We lost our keys… we can’t close!” (a reference to the fact that the café has been open 24 hours a day, 365 days a year since it opened in 1921), “Free Room and Board Every Day The Sun Doesn’t Shine In Desert Center”, “If You Don’t Believe Me, You Can Go To Hell, or Visit Me in Desert Center in August! Nuf sed, Steve”. Ragsdale was a teetotaler and once hung a sign on the door of the café which read, “No Drunks. No Dogs. We prefer dogs.” He was known to take a stick to travelers who were drunk in his café. When Ragsdale needed a teacher for his own children and the few others in the town, the county declined to send one; there weren’t enough students to warrant the expense. Ragsdale hastily built a basic structure of stick framing with paper board walls to use as a schoolhouse, and placed an ad in Los Angeles newspapers asking for an auto mechanic with a large family, which he got, and a teacher was indeed provided by the county. One morning, the town awoke to find that goats had gotten loose and had eaten the paper board walls of the schoolhouse as high as they could stand on their hind legs. The Ragsdales still have a photo of the goat-eaten schoolhouse. 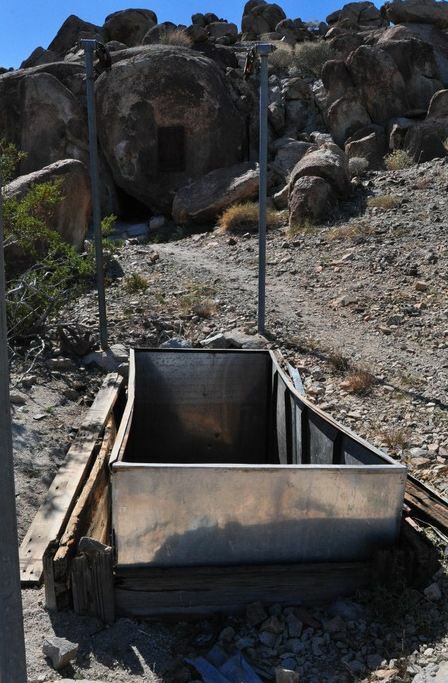 Within a few years, Ragsdale operated a number of satellite businesses in locations such as Cactus City, Hell, Skyway, Box Canyon, and (Shaver’s Well). Around 1950, he was accused of dallying with an office worker in his employ and left Desert Center in disgrace, living the rest of his days in self-imposed exile at his log cabin retreat near the summit of Santa Rosa Mountain. His sons, Stanley, Thurman, and Herbert, took over operations of Desert Center, and Stanley eventually purchased the town from his father. Stanley ran it for decades, adding a hamburger stand and the Stanco gasoline station. Ragsdale frequently retreated to his writing shack near the north tip of the rock formation called “The Alligator” (across I-10 from DC) where he composed bad poetry – the stanzas are referred to as “Spasm #1”, etc. – to be distributed in booklet form to travelers. 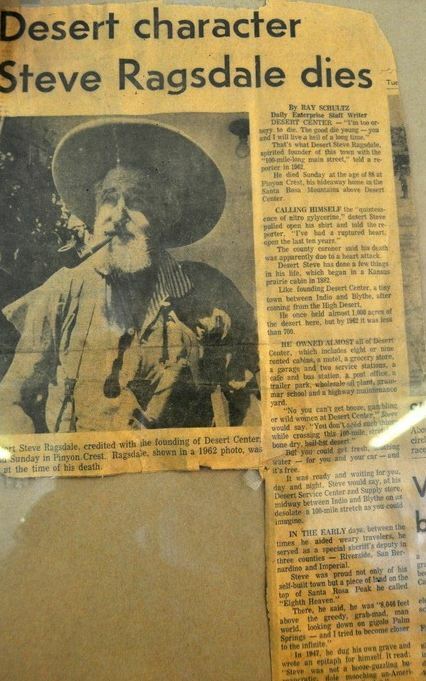 Ragsdale was a close friend of many classic “desert people” such as Randall Henderson, founder of Desert Magazine; Marshall South, the Hermit of Ghost Mountain; desert painter John Hilton; noted biologist Edmund C. Jaeger; and Harry Oliver, with whom Steve co-founded the annual Pegleg Smith Liar’s Contest in Anza-Borrego. Oliver often printed items about Desert Steve in his ‘newspaper,’ the Desert Rat Scrap Book.